Most of the users lauded the great design of the Puma Jamming; some mentioned they get compliments when wearing the shoe. Many runners mentioned that the shoe is very comfortable. Some wearers mentioned that the Jamming has a great quality. The running shoe runs true to size, a few users mentioned. The Puma Jamming fits perfectly, based on some comments. The shoe has an expensive price. The Puma Jamming is road running shoe with a street-ready design. According to some reviews, the shoe is superb when it comes to comfort, looks, and quality. Though it is expensive, many users still recommend the shoe for those who are looking for a fashionable running shoe. While I do like to believe that most shoe brands to their own due research, often when they come up with products which look a lot like another one on the market, one can’t help but wonder if they are pandering to a trend or merely imitating to cash in on the success of a rival brand. But such mirroring isn’t merely aping, sometimes it just makes good business sense to follow a certain style, shape, or silhouette. I mean just imagine if Airbus and Boeing were to decide that their planes shouldn’t look similar in any manner whatsoever! Adidas Ultra Boost Uncaged ATR - a similar raised sock uppers with notches and a generous cushiony sole. Even the ankle support seems somewhat similar in construct. But that’s possibly where the similarities taper off. The lacing is done through small eyelets that I would be hard-pressed to re-thread should the laces ever escape from them. But the eyelets have a reinforcing band which runs long and encases them on either side thereby ensuring a certain evenness of grip to the whole lacing system. The laces themselves are thick, much like in Reebok Floatride series, which makes them grip better once fastened. The two notches, one on the modified sock-tongue in front and the other around the back are exaggeratedly large but absolutely champers, they are real handy while donning or doffing this pair. A small Puma cat logo at the widest point of the toe-box completes the upper look as the iconic Puma formstripes are defined by black pipings which run down on the outer side, working as thick outlines. The irony is that the essence of Jamming lies not in its uppers but in its sole and yet my score will serve as the spoiler for what’ you are about to read. The TPU outer sole is tough, almost unrelenting. When you try to bend it, it resists. When you do finally bend it, it outright springs back. Feels great in terms of energy return but the trouble is your foot won’t ever be in that half-bent shape during a run; God help you if it is. So to land right, one really has to aim to strike with the mid-sole and even then the transition may feel a touch jerky/clumsy. The little rubber grips at the front and back of the sole provide the necessary traction. The highlight of this entire setup, however, lies in the midsole section where you will find tiny beads, hundreds nay thousands of them, all tightly packed into space between foot and outsole. These bits (B&W in my pair) are made of highly flexible PU and are free to move. Effectively, they should move in order to accommodate your foot and the way it rests on the sole-bed as also, absorb the impact of the landing each time your foot meets the ground. On paper, that is flawless and can’t be argued. In practice, or so I found, the balls didn’t really provide any great sense of cushioning. Or, even if they did, it was a bit reduced due to the stiffness of the outer sole which really could have been gentler. That said, I tried to reason it out with myself as I plodded with these through a run, if the outer were softer, it would crease each time my midfoot bends during take-off thereby displacing the beads and stripping away the cushion at that point. In other words, for the beads to be able to stay put even as they minutely displace themselves to accommodate my stride, they still need to be fairly held in place as it all would mean that I would be running with a lot of cushion at one point of my foot and nothing at the other. And chances are, the part which has no cushioning left is the one with which I am striking down with/on while the lesser in-use parts of my feet would sit high on all the extra beads. I will christen this the ‘Beanbag effect’. Unfortunately, it doesn’t sound like a great thing to have on a run. Also, their overall weight seems to be on the higher side, especially for a pair with sock uppers. This was another mark-downer. All said and done, I have now been on a few runs with these and over time, one does develop a certain affinity for the pair. So, I won’t say they are entirely undoable, I will just contend that they need a certain getting used to. The cushion is stiff but generous enough to shield feet and legs during long runs. The outer sole is certainly very durable and this is something I don’t get to see very often as most of my pairs start showing signs of extreme wear and tear after a mere 200 or so kilometers. Good for general training, long runs, and slow jogs, not the ideal pair to zip in or blaze through your next PB. This is what got me going back to them again and again. I wanted to pack a pair for my travels and ended up choosing these. My argument was that on any business trip, I won’t be looking at hard mileage or seriously draining workouts. To simply trod along these would work fine. More importantly, when it came to having a pair for denim-clad evenings, they’d be the ideal pair. To have the economy of not needing to carry an extra pair was tempting enough a bait. So I managed the runs which then had me getting accustomed to them and no evening went un-complimented for my choice of sneaks. I have the Dahlia colorway but the other options are equally, if not more, hip. So, would I recommend the race-day run-flat. It does look good, especially all that textured uppers and that almost “white noise” beady midsole; definitely score high on the easy-on-the-eye chart. For the price, it isn’t exactly an entry-level trainer but will deliver value-for-money over time and usage. With few of Puma’s premium features such as the evoKNIT and the NRGY foam, the Jamming is easily the brand’s top-of-the-line running shoe. The Jamming strives to look and feel fantastic at the same time with its innovative appearance. The evoKNIT upper of the Jamming provides the foot with a form-fitting comfort. It aims to give the foot a luxurious feel through its one-piece, sock-like fit. The stretchable quality allows the evoKNIT to accommodate various foot shapes. Meanwhile, the midsole comprises free-floating NRGY beads, which are made from polyurethane foam, a high-cushioning material. The globules adjust according to the foot’s movement to enable an adaptive support. They are encased in a translucent thermoplastic polyurethane (TPU) cover that acts as the outsole. This case is reinforced with rubber pods in high-wear areas to give ground-contact traction without the bulky weight. The Puma Jamming follows the standard running shoe length. Its structure is more elongated rather than full, therefore catering to low and medium foot volumes. The forefoot area is longer compared to other running shoes, offering extra room for toe splay. The Jamming comes in medium width for both the men’s and women’s versions. A unique thermoplastic polyurethane (TPU) case encloses the NRGY beads, therefore serving as the outer sole of the Jamming. This enclosure has a translucent finish to display the NRGY beads proudly. While it may only look stylish at first glance, this structure is, in fact, functional, as it provides high-level cushioning and comfort. For traction, the TPU case has rubber pods in strike zones, which are designed to come in contact with the running surface. With the pods’ minimal design, the runner feels less bulk without compromising traction. 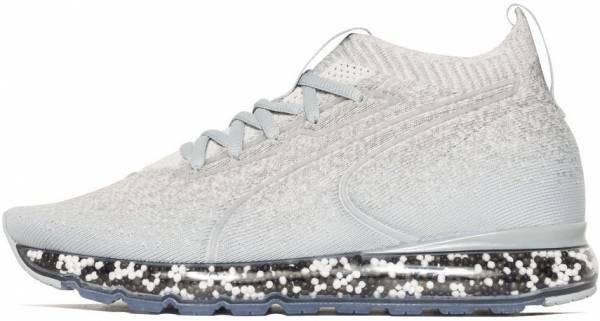 The thousands of NRGY beads that make up the midsole of the Puma Jamming permits unparalleled comfort and exceptional energy return. Not to mention, the unique structure is guaranteed to be an eye-catcher. The midsole works using the “jam” effect: The beads move with every step, therefore “jamming together.” This process results in a relaxed ride, as well as an optimum level of responsiveness. Aside from being an eye candy, the NRGY-bead midsole also promises shock absorption, flexibility, and natural mobility. With all these qualities working together, the foot is ensured a correct stride, a smooth transition, and an efficient running performance. The shoe also features an anatomically-shaped sock liner to provide additional cushioning as well as a contoured support to the underfoot. The sock liner is removable and therefore could be replaced by the runner’s custom orthotics or removed entirely according to preference. 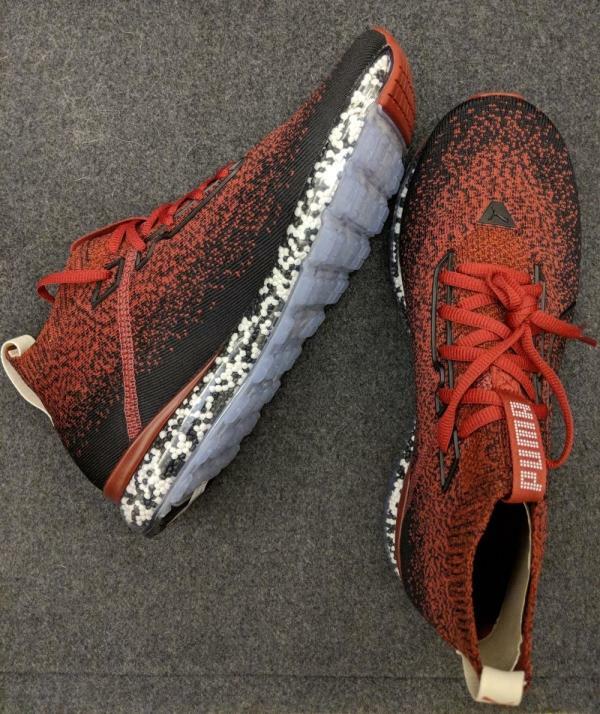 The Puma Jamming’s evoKNIT upper provides a seamless and breathable fit, ensuring the foot remains comfortable, ventilated, and healthy. This proprietary material is known for delivering a sock-like feel, with its smooth texture stretchable property. Relatedly, the shoe employs minimal and subtle overlays in the form of very thin piping designs to stay true to the sock sensation. There is an internal 3D heel clip that ensures maximum heel support throughout the gait cycle. It works by holding the heel in place and preventing unnecessary movements, such as slipping or sliding. The front and back of the collar have pull-tabs printed with the brand name, providing both style and function to the shoe. Another unique element of the Puma Jamming is the tongue. Unlike regular running shoes, this shoe has a tongue construction that is connected to the rest of the shoe – creating a unified structure. This form further emphasizes the sock-like look and feel of the evoKNIT upper.